Jokilyn who said: Love to go to the Dino Museum, Holiday Lights or Farm Country! Congrats Jodi! I will contact you by email then send the pass to you in the mail. Thanksgiving Point is a wonderful place for family fun in Utah. Keep reading for details on a Thanksgiving Point annual pass giveaway at the end of this post. 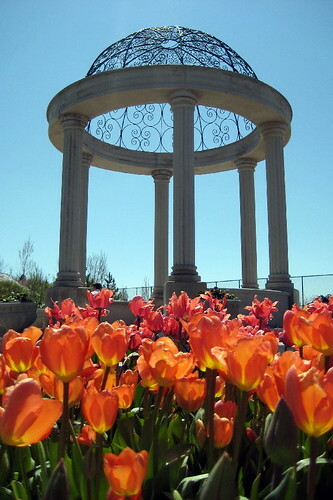 We welcome Spring each year by visiting Thanksgiving Point to view the Tulip Garden. Grandma comes from Brigham City and we take a picnic lunch while we enjoy walking around the gardens. Here are some pictures I took from this past spring. 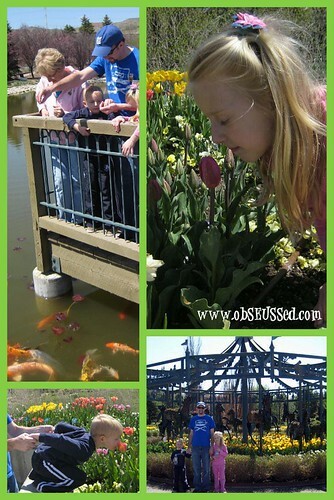 Our kids love feeding the large fish in the coi pond and smelling the tulips in the fragrance garden. We also love the garden carousel area. You may wonder why I am mentioning spring time in the middle of winter. 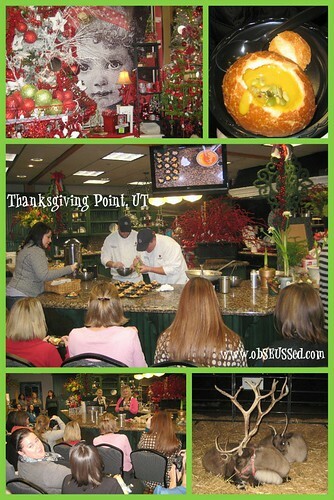 Well, I just had the opportunity to visit Thanksgiving Point last week during a Holiday Preview for local bloggers. I got to see a whole different side of the venue. We took a tour through their magnificent Emporium, sampled food from their Harvest restaurant (see the Seussalicious butternut squash soup below), and took a trolley ride to view their holiday light display. I can't wait to go back and take the kids through their holiday lights display. You can drive through, staying nice and cozy in your car or take a ride on their heated Trolley bus. They also have reindeer by the watertower. Santa visits at certain times too. The Emporium store was beautifully decorated for the holidays with a wonderful kid section featuring whimsical trendy toys, clothes and books. Farm Country, is great in the spring and warmer months with a petting zoo. The Museum of Ancient Life featuring Dinosaur exhibits, a fossil dig and Mammoth Screen 3D Theater and Megaplex Movies. What I'm most excited for is their new Museum of Natural Curiosity coming soon. They are currently raising funds to build the largest Children's museum in Utah. It sounds amazing and I hope to take my children there in the future. Disclosure: When attending the Holiday preview for bloggers I was given an annual family pass and an extra one to give away to a reader of obSEUSSed. All the opinions in this post are my own. One winner will recieve a Thanksgiving Point Property Membership (valued at $175) good for one year. See all the benefits here. To enter: Please visit Thanksgiving Point’s website and come back here to leave me your email address and a comment telling me what area you want to take your kids or grandkids to the most by midnight (MST) Friday, December 17 (so I can try to mail it to you in time for Christmas). Winner must have a valid U.S. address. Here are some other great Utah bloggers doing this giveaway if you'd like more chances to win. These others will likely post their giveaways soon: Veronica at Welcome to my Chaos, Elisa at Mormon Mommy Blogs, and Crazyland: Tales from the Motherboard, Rebecca at Blue Cricket Design, Jen at Tatertots and Jello. I'm looking forward to visiting Thanksgiving Point this coming year and hope others will join me. I'm so glad you stopped by, pull up a chair and stay awhile at obSEUSSed. Take a look around my blog and come back often for more Seusstastic ideas on kid crafts, family fun and children's books . I love to see holiday lights, but I think the reindeer would be my favorite! My favorite book is Snowmen at Night. We pretty much live at Farm Country during the spring and summer. My kids can't get enough of it!! I am a fan of TP on FB. I am a fan of Obseussed on fB. I love Fancy nancy books. I would love the tulip festival, too! My favorite book is "How the Grinch Stole Christmas"--it's so fun and clever! I'd love to see the Holiday lights with my grandchildren. My favorite Christmas book is "The Gift of the Magi." 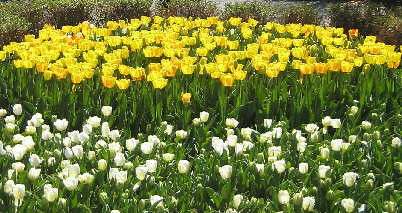 I would love to see the tulip garden. My sister talks about it all the time. One of my favorite books is "The Mitten". We read it to the children every year in Kindergarten. We love all things Thanksgiving Point. We have never been to the gardens though. Would love to take the kids there. I like Thanksgiving Point on Facebook. I Love the Gardens and the Dinosaur Museum!!! My favorite Childrens Christmas book is and has always been How the Grinch Stole Christmas! I "Like" obSEUSSed on FB! I "Like" Thanksgiving Point on FB! I like TP on facebook! My favorite Christmas book is "The best Christmas pageant EVER!!" Tee hee hee, have you read all the comments yet????? With all the boys running around the house we'd spend our time in the Dino area but with our one beautiful proncess we'd take her to the gardens so she dance among the flowers! I'll send you my email through FB!!! Love to go to the Dino Museum, Holiday Lights or Farm Country! We love the animals at Farm Country. But the Holiday Lights are my second favorite. We love the animals at Farm country! I haven't been to Thanksgiving Point in years. I would love to go more. The last time I went my kids really loved the petting zoo. My favoire Seuss book are, "Oh the places you'll go", and "the foot book"
I love taking my kids to Farm Country to do the pony rides. We love to visit in the gardens in the spring and walk down to the waterfall. We read the book "Christmas Mice" every Christmas! We'll head to the Dino Museum first. It's a great place to go with the kids when it's cold. I'm looking forward to spring in the Gardens. They do a Walk of Remembrance there each year where we go to reflect on the lives of our children who died in 2001 and 2007. Thanksgiving Point is generous to host this even every year, and I love the peacefulness that is there as we reflect. Really hard to pick ONE book, but I do like The Gift of the Magi and have loved it since I was a child. 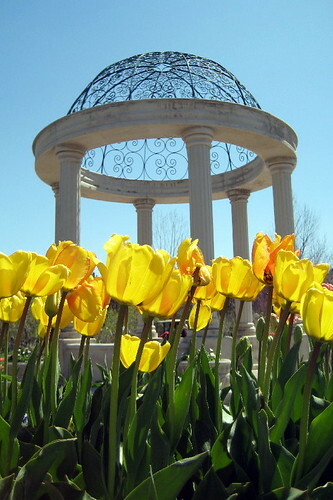 I've never been to the gardens and would love to visit them in the spring. I love "How the Grinch Stole Christmas". So fun and clever with a great message. I like TP on FB. I would love to go to the Tulip Festival. Favorite book - -Snowmen at Night! I have been reading your other blog for forever, the Saley Sanctuary! I didn't know you had this one!!! Please give my favorite Alana a BIG KISS from me! Looks like a lot of fun but I think the gardens would be great to see in the spring. Looks like yall are doing up the holiday right. We LOVE thanksgiving point! My son loves the Dinosaur Museum the most, but I think I enjoy the gardens the most. I love to take my family to all of their venues! my favorite childrens xmas book is the original Rudolph the Red Nosed Reindeer. Congrats! I will contact you by email then send the pass to you in the mail. THANK YOU, THANK YOU!! Soooo excited! !